“When you have a child who is ‘interesting’ you need to find an education provider that can be ‘interesting’ too. 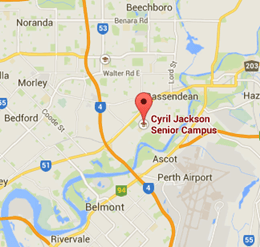 Cyril Jackson Support Centre is that interesting provider. Students in the centre are individuals and are educated as such. What you need to ask yourself is ‘what is the goal for your child’, what is the plan when school is finished. Before CJ’s the post school future was very scary. How would my child support herself, would she get a job, how would she move around – would she be ok on a bus by herself, or would she ever reach her goal of driving a car? “I am a parent of two young adults who have attended CJSCESC. My experiences with this centre have always been excellent. The staff are deeply committed to ensuring each student has the support to achieve his or her potential. “As a new student at this school, within the 1st Term my daughter aged 17yrs, had for the first time learned to read, write and catch public transport. She has made so many friends and her confidence and independence has grown to a level, I never would have expected. I cannot say enough to thank the staff for their continuous patience, kindness and support. My only regret is that I hadn’t sent her here 2 years ago. I believe high school years help shape children to adulthood. Thank you so much Cyril Jackson Senior Campus Education Support Centre for making my daughter’s world a happier place”.